The apex court, by directing the case to come up as a title dispute, which is a narrow legal facet of this case, has thus continued to manage the conflict. The Supreme Court is all set to hear the Babri Masjid-Ram Janambhoomi matter Thursday. The 130-year old title dispute poses a slightly counter-intuitive idea: perhaps justice delayed isn’t always justice denied. Could delay be a containment strategy in a highly volatile matter such as this one? The top court is often lauded for its counter-majoritarian role and as defender of civil liberties, but seldom is it commended for acting as a ‘safety valve’ in intractable disputes such as this one. We underestimate the crucial role it has played in managing the fallout from the Babri demolition, often recalled as the second partition of India, which sparked communal riots across India with reported deaths of over 1,000 people. The Supreme Court, by directing the case to come up as a title dispute, which is a narrow legal facet of this case, has thus continued to manage the conflict. Polarising groups have shown restraint as the matter is ‘sub-judice’, and political groups invested in polarising have kept their discourse in check so as to not upset the court. The court’s strategy, it appears, was that either the matter will fade from public consciousness or the political discourse will address it. However, this strategy has run its course and it is now before the Supreme Court. 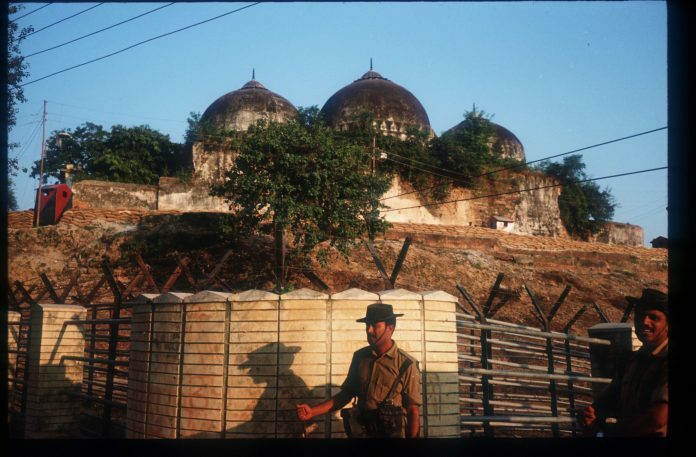 The title dispute must be distinguished from the criminal case looking into the demolition of Babri Masjid. It is a fact that the criminal matter against BJP leaders such as L.K. Advani, Murli Manohar Joshi and Uma Bharti was still languishing in a session court and the Supreme Court had to step in to revive conspiracy charges. However, the conflict management role of the court we discuss here is restricted to the title dispute. The President referred the title dispute to the Supreme Court in 1994, asking its opinion on the question of whether a Hindu temple or any Hindu religious structure existed prior to the construction of the Ram Janambhoomi-Babri Masjid, in that spot. Calling the question “superfluous and unnecessary”, the court declined to answer. We see this refusal as a strategy to not reopen fresh wounds. The court said that the matter should be heard like any other title dispute through the appeal process. In March 2017, Justice J. S. Khehar even offered to mediate to arrive at an amicable settlement. This dispute, in essence, is an adjudication on ‘faith’. Is it the birthplace of Ram? Are mosques an essential part of Islam? No one wins in this adjudication. Any dispute which feeds into a historical narrative of religious desecration and involves a site of communal violence, has more than a ‘title of the land’ at stake. That the title adjudication will lead to competing claims of Ram and Allah on the piece of land is a forgone conclusion. The Supreme Court’s ability to adjudicate outside strict legal disputes is a function of its ‘public legitimacy’. Despite systemic deficiencies, the legitimacy it holds is an exemplary achievement of the Supreme Court. However, there is a difference between ‘authority’ and ‘legitimacy’. While the authority of the apex court to be the final interpreter of law flows from the Constitution, the acceptance of that authority is what gives it ‘legitimacy’. Even while deciding a seemingly political dispute, courts show a fidelity to formal legal tools — texts, statutes, precedents, and evidence. This affirms the legitimacy of the court. Its judgments and observations are valued because of this legitimacy that it enjoys. Public legitimacy is contingent on various factors — populist interventions through PILs, the exercise of public reasoning, and its image as an independent and non-corrupt institution. It is this legitimacy accumulated over decades that helps in deciding such volatile disputes effectively. Pratap Bhanu Mehta notes that the Supreme Court reaches the ‘modus vivendi’ of managing conflicts by giving something to every party, and making them believe that they have a stake in the system, without disturbing the applecart. It performed a balancing act in the reservation cases by upholding reservations but limiting it by excluding the creamy layer, and it came up with the test of essential religious practices which recognises the fundamental right to religion but also allows room for reform. However, recent developments — the corruption scandal, the faction, bench-fixing allegations — might have dented the image of a transparent and non-corrupt institution. The seeds of doubt sown in public memory could take away from the court’s legitimacy. Public legitimacy is a shifting value with various organs competing for it. With the newly developed cracks in the judiciary, the politics might reclaim its hold on the narrative and lead to polarisation on communal lines again. There is an uneasy relationship between the judiciary and other branches, and the general refrain from overturning or assailing court orders is not only in deference to some higher principle of separation of powers, but due to the fear of popular backlash. At this juncture, with an issue as polarising as Babri, the balancing act will be difficult for the ‘battered’ Supreme Court. Nevertheless, before the Supreme Court hears the case Thursday, it is time to acknowledge its role in containing the communal conflagration from engulfing the country. We must recognise the difficult role it is playing, using its public legitimacy to prevent the issue from ‘imploding’. The role of the Supreme Court as a conflict manager is underappreciated but necessary in a country riddled with differences where every group is a minority in some respect. Satya Prasoon and Ashwini Tallur are lawyers working with the Centre for Law and Policy Research, (CLPR )Bengaluru. There are Associate Editors for the Supreme Court Observer Project, a non-partisan journalistic effort to make the Supreme Court work intelligible to anyone interested in Indian public affairs.